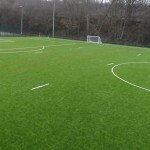 Sand dressed pitch dimensions are one of the first things you need to decide upon before having a sports pitch constructed – the best way of deciding how big you’d like your sports pitch is through how many people are likely to be using it, as there are so many different ways to make the most out of your sports facility. You also need to take into account the amount of existing space you have available to ensure the dimensions will fit within the specified site area. If the sports facility is being used for competitive reasons, it’s best to find out if there is a specific sand dressed pitch dimensions that are required. If you are a school that has a high number of pupils, getting a sports pitch with large sand dressed pitch dimensions will allow for more children to use it. We also offer a variety of line markings that can be installed onto any of our surfaces, this will help give you a better idea of the sand dressed pitch dimensions that are suited to your institution through deciding which sport the surface should be used for. 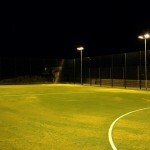 The sand dressed surfacing sizes will obviously vary from facility to facility, the biggest factor when calculating the size you want your sports pitch to be is the sports you are going to be using it for, and whether it is being used competitively as the sand dressed surfacing sizes may have to fit a certain criteria for professional or competitive usage. 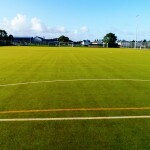 If are using the sports pitch mainly for tennis, then the sand dressed surfacing sizes for the pitch as a whole would not need to be too big, this is to allow enough room for the tennis courts but nothing else, however if you were planning on using the surface as MUGA then if you have a big surface area with a variety of line markings you can fit more sports into one location, meaning the surface wouldn’t have to be as big.